Made in a suburb of Fukushima, Shimizucho 清水町, which was formerly called Nekkochoo. The dolls are very similar to Tsutsumi ningyo dolls and Hanamaki dolls. Their history goes back to the Edo period, around 1805. 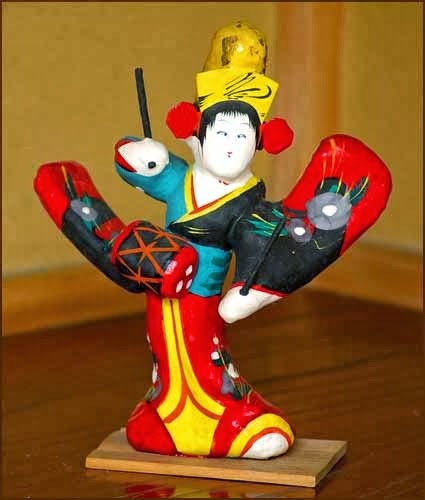 They were first made by the owner of a lodging, who was also versed in painting and woodcarving, Takahashi Kichijiroo 高橋吉郎次. During the time of his grandson Zooe 増兵衛, dolls for the seasonal girls festival became popular, but he also made Anesama sister dolls of cloth. This family business was given up in the Meiji period.
. 二福神鯛車 Two Lucky Gods with a sea bream on a cart .
. shishi kaburi 獅子かぶり carrying a Shishi on the head .
. Mount Haguro 羽黒出羽三山 .
. Kite 凧 tako .
. . . . . the zodiac rooster on a catfish ナマズの上に鶏 . . . . . . . Daruma on a plump sparrow . . . . . . . Inu 戌 /　犬　Dog from Nakayukawa . 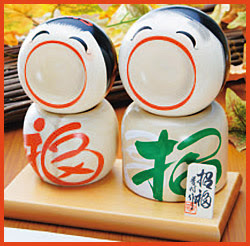 Click for more Nakayugawa clay dolls !
. akabeko　あかべこ　/　赤べこ　Aka-Beko - red cow, red bull .
. E roosoku 絵ろうそくcolored candles .
. Aizu toojin tako 会津唐人凧 Aizu Tojin - Chinese face kites . OkuAizu 奥会津 is famous for its kago かご baskets and zaru ざる sieves made from natural materials. 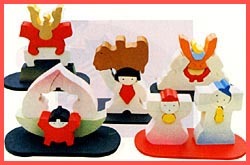 Oku-Aizu Amikumi Zaiku”, or Oku-Aizu braided craft products, is said to have been started by farmers as a handiwork during the off-season in winter. The daily necessities such as baskets and sieves made with plants of wild vine and silver vine are popular for their simple taste. The mino 蓑raincoats of the farmers were made of hiroro ヒロロ, local dialect for ミヤマカンスゲ/ 深山寒菅 miyama kansuge (Carex morrowii). What is Oku-aizu braided crafts ? 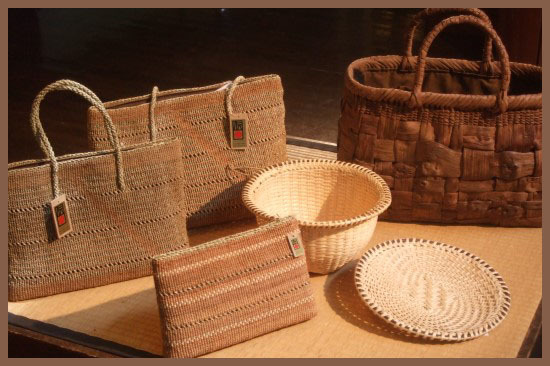 Okuaizu Amikumi Zaiku is basketry produced in the Mishima Town area, Onuma County, Fukushima Prefecture. This mountainous area in the Okuaizu region has much snow and during winter farmers are unable to work in the fields; as handwork in the snowy season, the craft of basketry has been handed down from olden times. マタタビ細工 Matatabi Craft made from silver vine. 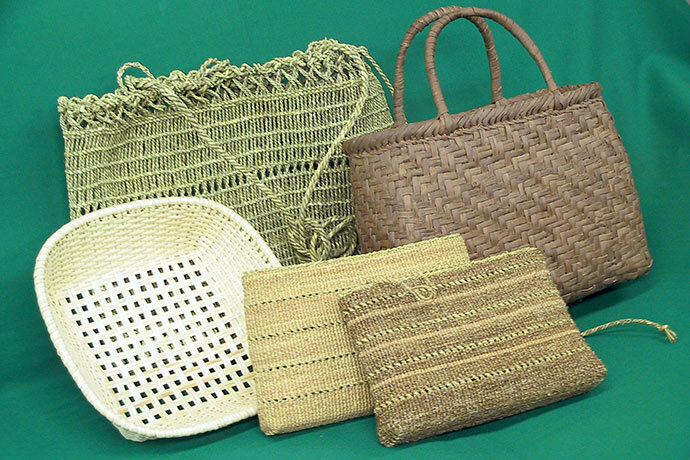 Okuaizu Basketry is distinguished by the use of local natural materials and their superb hand-weaving, which although simple, has a distinctive delicacy. 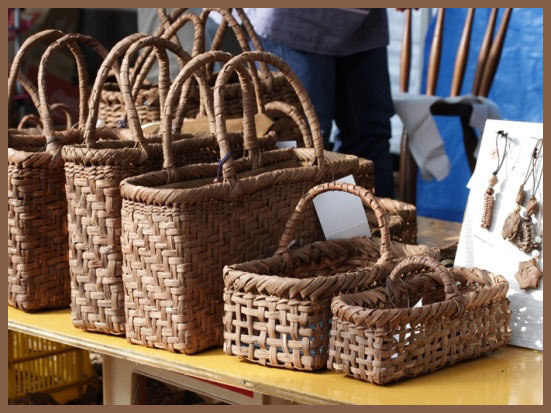 As Hiroro Craft, hand baskets, large baskets, and shoulder baskets are made by fine-weaving the sedge grass into a finish resembling lace stitches. In Yamabudo Craft, the tough crimson glory vine lends itself to making robust baskets and confectionery bowls. For Matatabi Craft, cooking utensils are mainly produced because silver vine baskets are pleasant to the touch and easy draining. 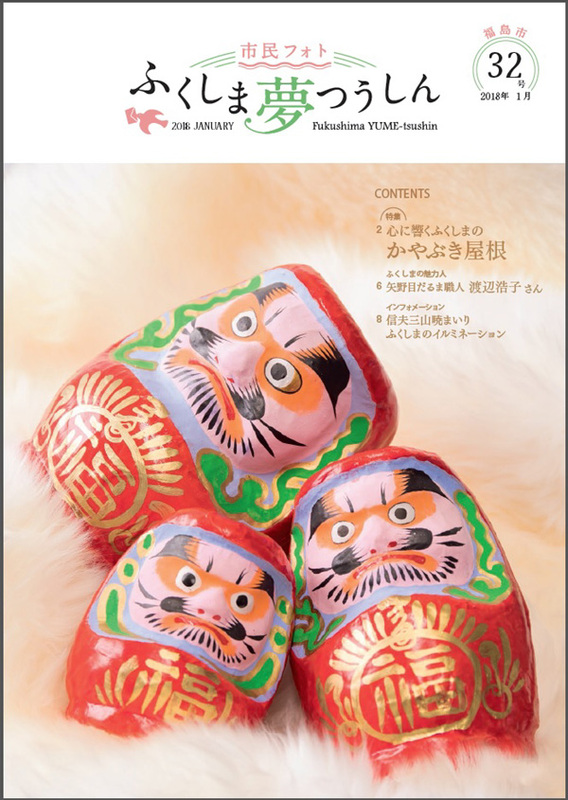 Okuaizu Basketry is a traditional craft embodying the spirit of monozukuri (art of craftsmanship), in which local people in harmony with nature make the daily necessities of life. Fragments of simple basketry and rope were discovered at the Arayashiki archaeological site in Mishima Town, proving that such skills and techniques already existed in the area as far back as the Jomon period (14,000 to 300 BC). 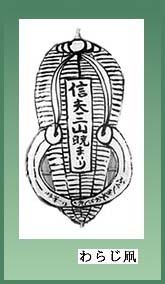 More recently, in old documents such as the “Aizu Nosho (Book on Agriculture in Aizu)” written in 1684 and “Toyu Zakki (Record of Journey to the Ou Region” in 1788, we find descriptions of basketry; although the origins are not clear, it would seem Okuaizu Basketry items have been made on a daily basis in this region for several hundred years at least. The skills have been handed down to the present, but during the late 1960s, due to an aging population, the number of basket weavers decreased. Mishima Town was concerned if nothing was done, the craft would be lost, and aiming at the establishment of a local industry, the town embarked on a movement to promote the use of such handcrafted utensils and baskets on a daily basis. This campaign has spread through the region over the years and at present, more than 100 artisans are keeping the skills and techniques of Okuaizu Basketry very much alive. 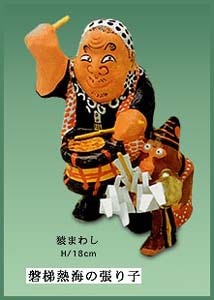 The image shows a man leading a monkey, 猿まわし sarumawashi. 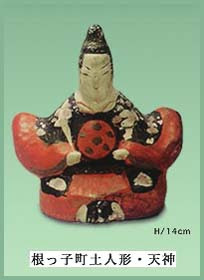 Other dolls of this unique kind are Kintaro on a carp, the god of wind and more. 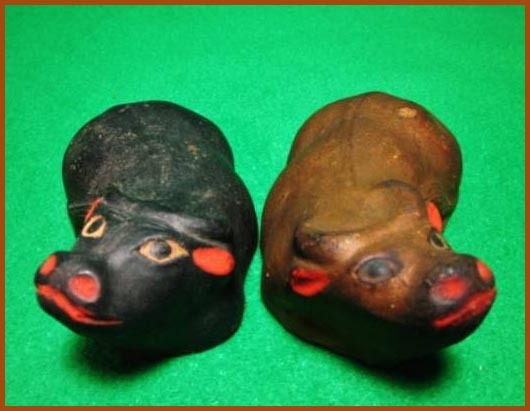 They are sold in the shops of the hotspring. In the area around the Aizu basin, which lies in the middle of Fukushima Prefecture, lacquer working dates back to about the 15th century. The firm foundations for Aizu lacquerware were later laid when a number of lacquer craftsmen were brought in by a new feudal lord who was transferred from Shiga to rule the land. 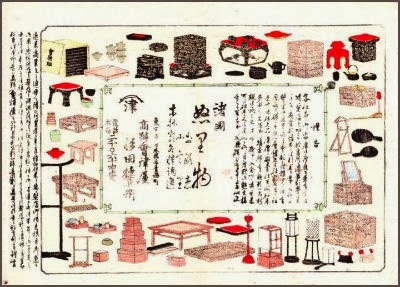 In the second half of the 18th century the feudal administration of Aizu took the initiative and started directing production after inviting various craftsmen from Kyoto, who specialized in gold dust application and other decorative techniques. Aizu lacquerware is the product of a distinctive manufacturing system involving a fine division of labor, that allows volume production while using handcrafting techniques. Specialist craftworkers perform separate tasks such as wood forming and lacquering, so each contributes a high level of skill that leads to the creation of finished items of superior quality. The types of lacquerwork being particularly famous are a special technique called hananuri (a lacquering technique that goes through the process of coating with lacquer, drying and finishing without polishing) and the decorative use of gold dust to create gorgeous designs known as makie. 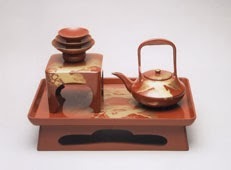 Aizu remains one of the most famous lacquerware production centers, producing mainly furniture and other items for household use, including bowls, trays, cake dishes, stacking boxes, and sake servers.
. urushi　漆 lacquer ware from Japan . Among the different types of Aizu cotton, a traditional handicraft product from the Aizu area in western Fukushima Prefecture, Aoki cotton once enjoyed great popularity for its quality. Demand for Aoki cotton took a downturn, though, amid changing lifestyles after World War II and all production plants in the town of Aizubange were closed some 30 years ago. 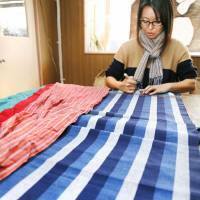 In October 2011, reluctant to allow local craftsmanship to fade into history, young entrepreneur Takuro Yazu set up a company in 会津坂下　Aizubange to work on reviving Aoki cotton. His company, IIE Co., involve people who evacuated from areas affected by the March 2011 nuclear meltdowns at Tokyo Electric Power Company Holdings Inc.’s Fukushima No. 1 power plant in the prefecture. IIE successfully revived Aoki cotton for the first time in 30 years, using refurbished century-old looms. There were two stores in Edo, also called Aizu lacquerware dealers 漆物問屋. Display from the old Aizuya store.
. O-Ningyoo Sama お人形様　O-Ningyo Sama Deity .
. Adachi koma 安達駒 horses .
. Kurozuka ningyoo 黒塚人形 Kurozuka dolls .
. Miharu koma 三春駒 horse .
. Miharu　Daruma 三春だるま . 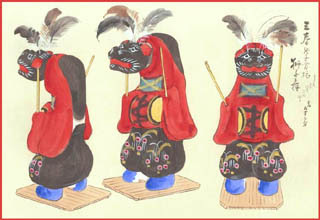 The drum is part of the ancient court music, gagaku 雅楽. Both sides are ment for hitting with the drumstick, resembling the drums from ancient China and Korea. 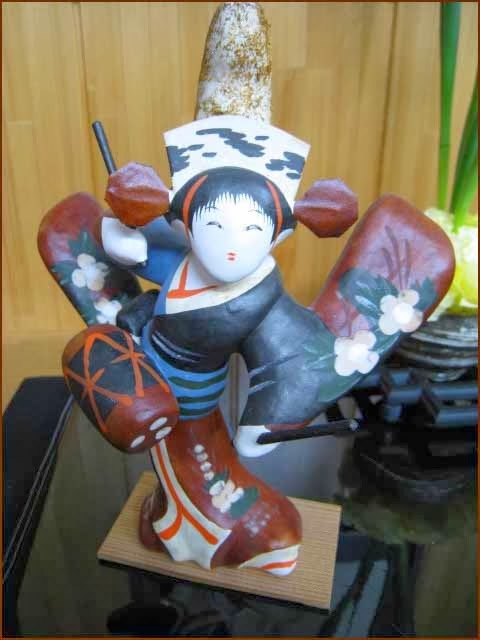 This girl has the drum in front of her belly and dances while hitting the drum.
. gagaku 雅楽 court music .
. Hariko 富岡張り子 papermachee dolls. 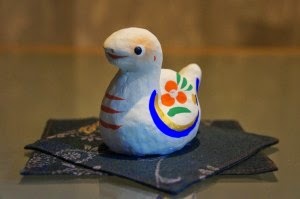 The Deko Yashiki dates way back to the Edo period and the present owner is in the 21st generation. 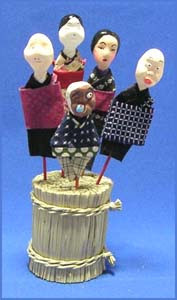 ”Takashiba Deco Yashiki” in Koriyama consists of five houses where people create papier-mâché (paper dolls). Dolls crafted here have free-flowing line created by a wooden mold and pasting paper. Creators re-designed this year’s Oriental zodiac dolls whose mouth opens more charmingly than a previous one, which makes a smiling face. Its product name is “Auspicious snake”. It was created with a hope that it brings smiles to viewers. They have been made until the Showa period. and three white rabbits, usagi Daikoku 兎大黒.
. Usagi Daikoku 兎大黒 Rabbits and Daikoku .
. Taimatsu Akashi 松明あかし Torches Festival in 2011 . 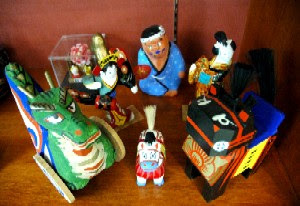 They are made with patterns for the doll festival of the girls or the Boy's festival and other seasonal festivals. They also feature legendary people and animals. They are cut out from one piece of wood and then laquered. Even the imperial family buys dolls from this store. The inspriation for them are the kendama toys けん玉 of a ball on a string. They are rather simple with happy faces. Koson has won many prizes for this dolls and other artwork.
. Cup and Ball けん玉 kendama - Introduction . During the great famine of Tenmei in 1782 the number of inhabitants of the fiefdom of Soma declined rapidly. The daimyo of that time tried to get second and third sons of other fiefdoms to settle in his domaine and bring it back to life. Many came from Toyama, where they had been living in a difficult situation under a determined priest and strong religious rules. 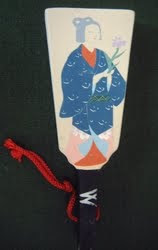 People made small funny dolls of these imigrants in their travel gear, putting them on sticks (kushi ningyoo 串人形) and tried to express their suffering in the strange funny faces. At that time the domain of Soma increased about more than 1300 people in 10 years.
. Famine in Japan 飢饉 kikin .
. 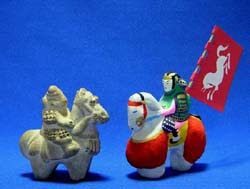 Horse toys from Fukushima .
. kurumi zaiku　胡桃細工 / クルミ細工 carvings in walnut shells . click on any of the underlined words to see the photos. Sukagawa City is the hometown of Tsuburaya Eiji, creator of Ultraman.
. Reference and Photos .
. ejiko えじこ baby basket .
. Kawamata Silk　川俣シルク　.